Amazon is cornering another market … MBAs. “Flooding the zone” to land the best & brightest. Now that Amazon has staked out territory the grocery business, it’s time for them to move on to another front. Amazon is now the top MBA recruiter at Carnegie Mellon, Duke and Cal-Berkeley. It hires the most first-year M.B.A.s at Michigan, MIT, Dartmouth College and Duke. Last year, Amazon took in more interns from the University of Chicago than either Bain or McKinsey & Co., which were until recently the school’s top hirers of interns. P.S. 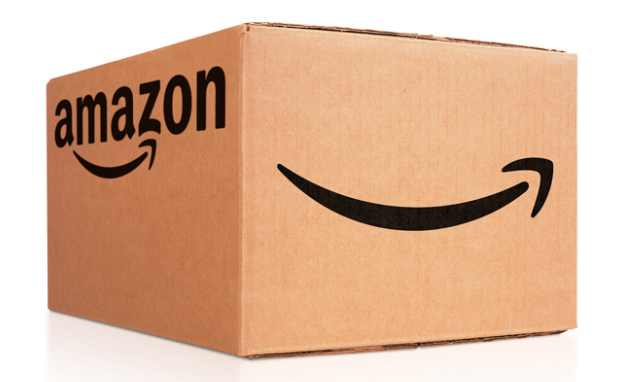 Amazon misses earnings forecast … and warns that operating income may fall to zero. Not a good day for Jeff Bezos …. Psst: Did you catch what Trump said about Amazon? Trump lashed out at his “accusers” and said he was going to sue them. Said he’ wouldn’t allow the AT&T – Time Warner deal to get approved … because of a concentration of power. Of course, his opposition was not because CNN is a part of the deal. “Slow-boating”: What’s up with Amazon? I used to heap high praise on Amazon. Not so much any more. 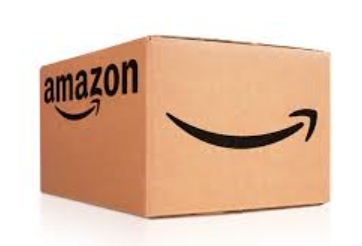 Free shipment time from Amazon used to be one of my primary economic indicators. If a free shipping order arrived in 2 or 3 days, I concluded that the economy wasn’t doing so well. If there’s space on planes & trucks then they get loaded. If there isn’t, then the orders sit on the docks. So, in a slow economy, orders come fast. 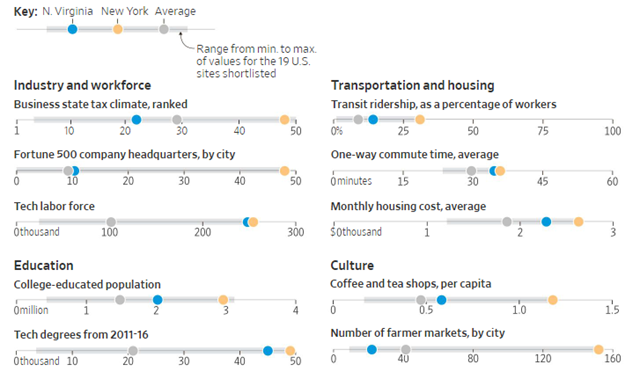 In a hot economy, orders take longer. 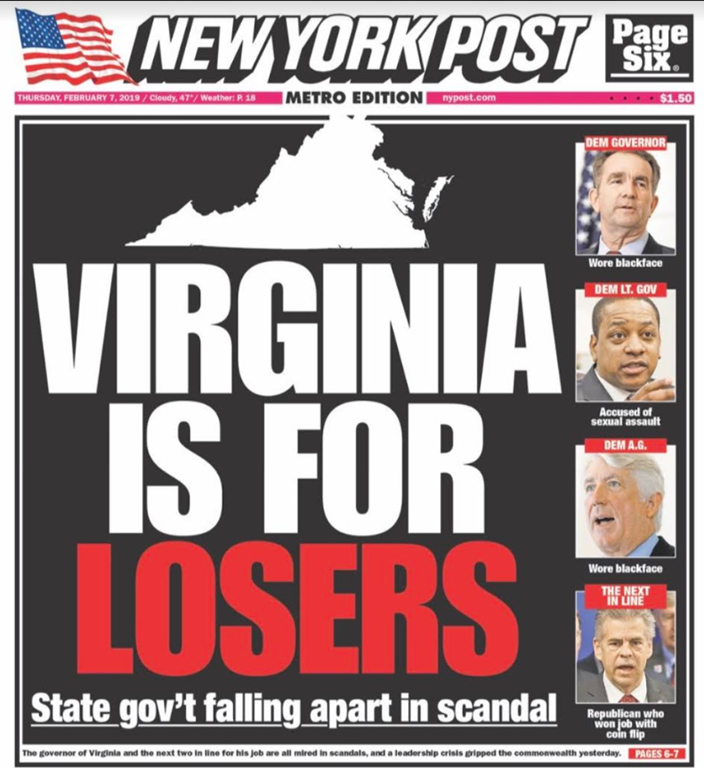 At least, that’s the way things seemed to work. 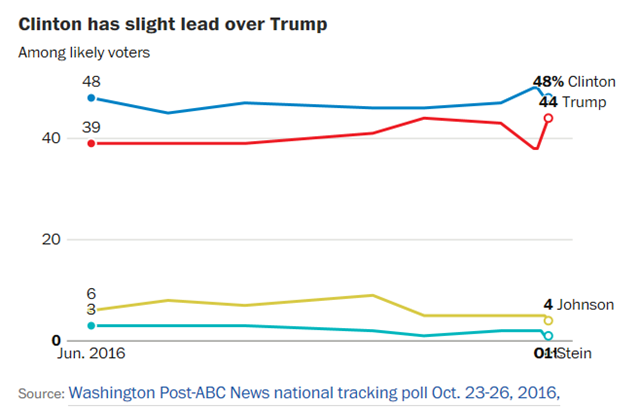 Not so predictable these days. Based on Ken’s UEI (Ultimate Economic Indicator), maybe the economy is improving.. It has been 10 days since I placed a “free shipping” order with Amazon. 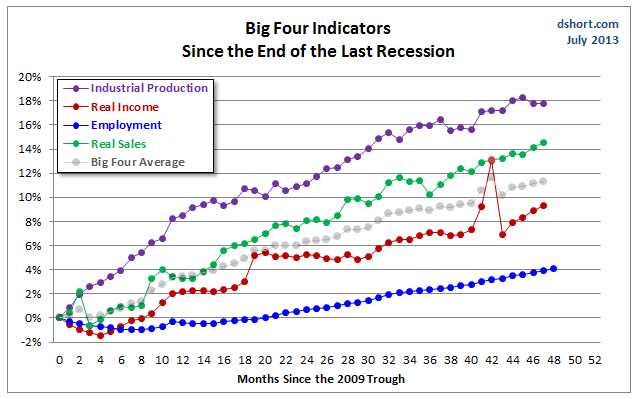 There are a lot of indicators bandied about to ‘prove’ how well or poorly the economy is doing. There’s GDP, unemployment, CPI, and many, many other metrics. Sometimes they provide a consistent view of the economy … sometimes they contradict. Ken’s UEI (Ultimate Economic Indicator) … the real gauge of the economy. Amazon locker … old school or new school? 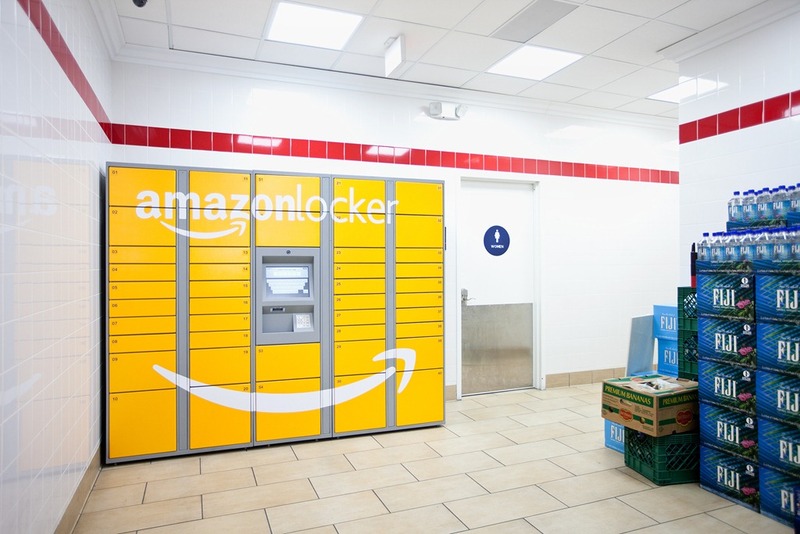 Punch line: In an effort to further connect digital with brick and mortar, Amazon is installing lockers in a number of retailers including Staples and Rite-Aid. Heading into last year’s year-end holiday selling season, Amazon … felt some backlash when it provided an app that allowed consumers to find lower prices on any products they found at competing brick-and-mortar retailers. This year, Amazon is finding plenty of new ways to corral consumers as the holiday seasons looms ever closer. Staples, the largest U.S. office supply retailer, is planning to install Amazon-branded lockers in its stores that would allow consumers to have Amazon packages shipped to their stores for pick-up. Amazon already has similar deals with a few grocery, convenience, and drug stores, including at select D’Agostino, Gristede and Rite-Aid stores in New York. 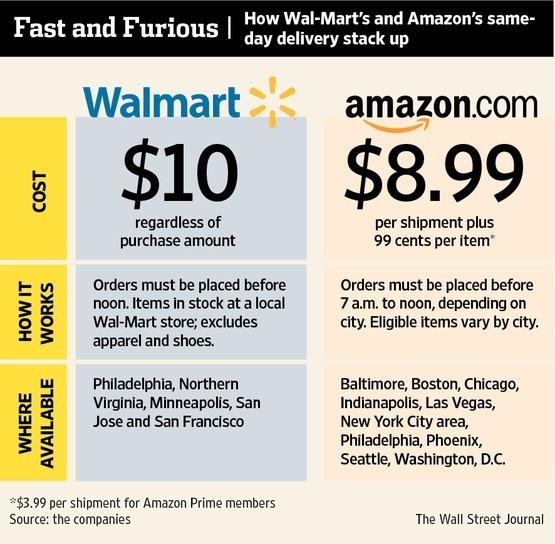 Punch line: Wal-Mart is launching a new same-day delivery service to compete against Amazon.com this holiday season. Wal-Mart boasts a huge network of stores to ship product from, but Amazon has effective operational efficiencies and loyal customers. This season, who will win the holiday war? In its latest bid to take on Internet powerhouse Amazon.com this holiday season, Wal-Mart is promising same-day delivery in some cities for orders placed online. The retailer began testing the new service in select cities last week and says it will cost $10 regardless of the size of the order. Called Wal-Mart To Go, the products will be shipped from the company’s stores, not from a warehouse or distribution center. Over the past several years, Wal-Mart has launched several attacks on its online rival, including a price war over best-selling books three years ago. This time, Wal-Mart is betting that its network of thousands of stores … can help it compete head to head with Amazon, which has increasingly stressed fast, free or low-cost deliveries. But shipping from stores, rather than from warehouses as Amazon does, is expensive, analysts said. It can be three to four times the cost for the retailer to pick items and pack them from a store versus having a really efficient, automated process back in a distribution center. Wal-Mart has been ramping up its e-commerce business, which employs 1,000 workers in San Bruno, Calif. The retail giant has acquired nearly a dozen start-ups to help broaden its online presence and developed @Walmart Labs, its Silicon Valley tech shop that has revamped the walmart.com website and mobile applications to make them more competitive with Amazon and other online retailers. Wal-Mart also has been trying to compete with Amazon’s prices inside its stores. In some, it has quietly begun matching the online retailer’s prices when customers ask, a practice historically done only against local brick-and-mortar competitors. Wal-Mart also has been trying to use its stores to tap into millions of shoppers who either don’t have credit or debit cards or don’t feel comfortable disclosing their personal financial information online. In April, the retailer began a program that allows customers to order merchandise online and pay for it at a store with cash.